Inspired by people in Charleston, S.C., Spokesman.com is launching an effort to bring Twitter users in the Spokane area together for a common goal: sharing information. People posting to Twitter already use hashtags, or codes preceded by the # sign, to group information under common categories. By using the hashtag convention, related information can be quickly found via Twitter Search. 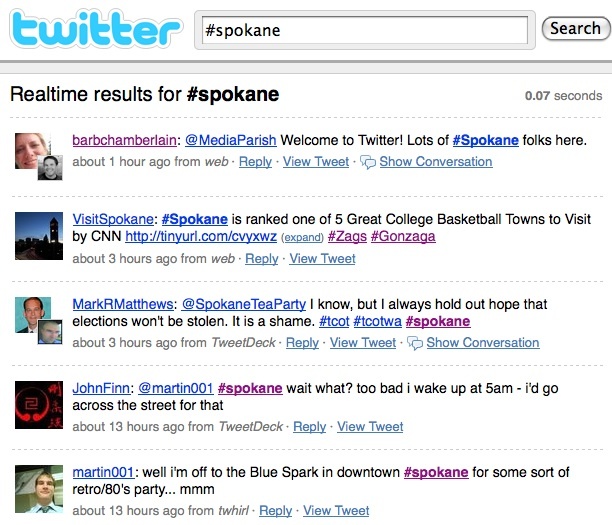 To illustrate, here's a screen grab from a Twitter search for #spokane, a generic hashtag some Twitter users are already using. If local Twitter users agree on a common set of hashtags, everyone will be able to easily find — and contribute — news about life in the Inland Northwest. Here are the hashtags we've modeled on ideas from the Charleston summit. #SPONEWS - For information considered newsworthy but not breaking or rapidly developing. #SPOEATS - Information related to food and drink. #SPODEAL - Bargains, deals, sales and other ways to save a buck. #SPOCOOL - Cool things. A generic category for concerts, popular events, happenings. #SPOWX - Weather. A deviation from the 7-letter rule because WX is already a common abbreviation. #SPOBIZ - Business news. Another deviation that just makes sense. One option is to search periodically for a given tag at search.twitter.com, although to get real-time results you would have to refresh the page in your browser continuously. A more hands-off approach is to grab the RSS feed from any search and subscribe to it in your reader of choice, such as Google Reader or Bloglines. Finally, some Twitter desktop clients — Twhirl, Tweetdeck — can be set up for real-time search. This lets you follow the hashtags while conducting your other Twitter business. This is a work in progress that relies on participation from you, the Inland Northwest Twitter users. To start, please include appropriate hashtags in your updates so we can get this off the ground. If you've got suggestions for the project, e-mail us or send us a direct message on our Twitter account.